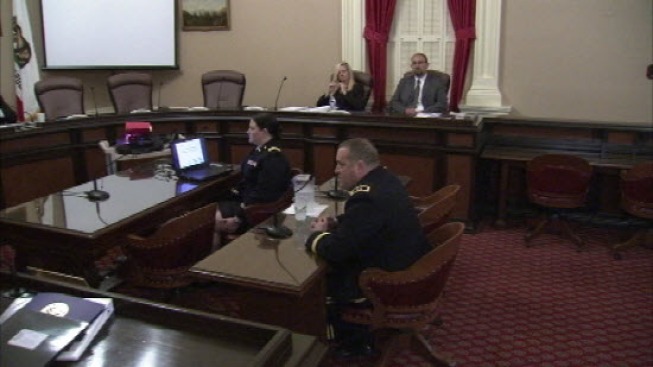 State senators asked tough questions to the leader of the California National Guard on Wednesday, putting the California Military Department under a legislative microscope. In a hearing to address problems in the Guard, Sen. Lou Correa described the department as one that has been in crisis and filled with scandal in recent years. During his February 2012 confirmation hearing, Adjutant General David Baldwin promised to address the department’s significant cultural issues that he inherited when he was appointed as the California National Guard’s highest-ranking officer. “I appreciate the opportunity to give [the senate] an update on the tremendous progress that we have made in the California Military Department continuing to build on the progress that we made in our first year in command,” Baldwin told the senators. In a series of investigations, NBC Bay Area and KNBC in Los Angeles exposed a culture inside the Guard where sexual harassment, racism and retaliation at times go unchecked. Nearly two-dozen members of the California National Guard have come forward to the television stations describing the culture as toxic. During Wednesday’s hearing, Baldwin told state lawmakers that the Guard has made major improvements under his leadership. Specifically, he was forced to address a critical report that identified failures in the way the Guard handled reports of sexual harassment, racism and retaliation. The report, which was co-authored by Chief Warrant Officer Ronald Petty, a respected member of the Oklahoma National Guard, was exposed by the NBC Bay Area-KNBC joint investigation. The Guard had trouble explaining how a critical report commissioned by the National Guard Bureau and funded with tax dollars was somehow not presented to Baldwin until after the NBC Bay Area and KNBC investigations. When asked by the Investigative Unit if the Petty report was a waste of taxpayer money, Baldwin said that it would have been money well spent but the National Guard Bureau did not follow up on the report in a timely manner. The Petty report criticized the California National Guard’s failure to meet National Guard standards in handling complaints by Guard members. During Wednesday’s hearing at the state capitol, a representative from the National Guard Bureau said the NGB recently provided additional training and that the California National Guard is now in compliance. Click on the links below to watch previous investigations into the California National Guard.